+ Having Jason home and off work for a few days. He is always away a lot for work, but the last month and a half it has been more than usual, and it's starting to take a toll. It's been a treat having him around more! + Austen is doing great with potty training! I'm still pinching myself at how easy it was this time around. + Playing outside in the snow. + Taking the boys skating a few weekends ago. JJ had so much fun and did so great :) (Austen only wanted people to 'zoom' him around the ice - didn't really have much of an interest in skating himself). + Austen has become obsessed with books. 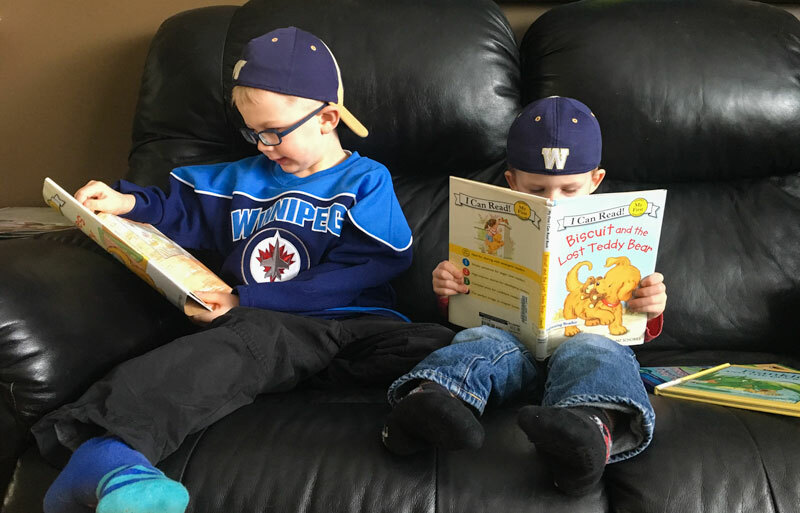 JJ has always loved books and reading, but Austen had no interest for the longest time. About a year ago he became tolerable of being read to, but it's gone to a whole new level now. He wants to be read book after book after book and is so interested in them. It makes this book-nerd mama so happy! + Watching Brooklyn Nine-Nine. Love that show, such a great ensemble. I've watched them all before, but Jason just started watching it on Netflix, so I've been re-watching them. + Things are finally starting to get back to normal around here. All four of us have had strep throat in the last month (ugh!!! ), and I had the added bonus of developing scarlet fever from it. Needless to say, it's been a crappy month. But yesterday was the first day in a long time I felt back to normal and actually motivated to do anything! + Getting back into the practice of handlettering. I'm a total beginner, but find it so fun and relaxing. + JJ is loved his Valentine's party at nursery school yesterday. He had so much fun signing all his valentines cards (hockey ones, of course), and was so excited to look at all his valentines from his friends. His teacher also painted hearts on all of their cheeks, and he just loved it - they didn't come off until bedtime. His excitement is the best.